What happens to LGBT people when they get old? Do they have to go back in the closet, or has society changed enough to make space for them? 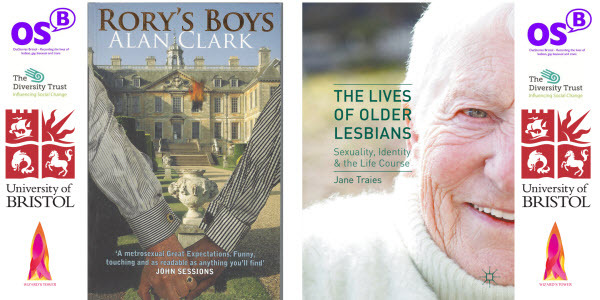 This event will include readings from Alan Clark, author of Rory’s Boys, a comedy novel set in a retirement home for gay men, and from Dr. Jane Traies whose historical study, The Lives of Older Lesbians, was published this year. Alan and Jane will be joined for discussion by Dr. Paul Willis of Bristol University, a researcher in sexuality, ageing and social care, and Berkeley Wilde of The Diversity Trust who has recently completed a study of the health needs of LGBT people in Bristol and the surrounding areas. The event will be chaired by Cheryl Morgan of OutStories Bristol. The event is co-hosted by the Centre for Research in Health and Social Care, School for Policy Studies, University of Bristol. This event is part of the Bristol Festival of Literature. Free admission but please book on Eventbrite. The Lecture Theatre is on the ground floor with ramped access from Berkeley Square.